The apricot (Prunus armeniaca) a native of China, has been cultivated for over 4,000 years. In the United States, 95% of apricots grow in the San Joaquin Valley and other parts of northern California. Apricot trees are hardy, drought resistant and long lived (100 years plus) but the fruit is highly perishable and for full-flavor must be tree ripened. Fresh ripe apricots are very soft and do not ship well. Less than 10% are sold fresh; most of the crop being canned, dried or used in preserves. In 1778 Thomas Jefferson was growing apricot trees at Monticello. Apricots originally came from China. This golden fruit has been around for more than 4,000 years. Apricots progressively made their way through the Persian Empire to the Mediterranean where they were fondly adopted. Spanish explorers introduced the apricot to the New World, and they were planted in the gardens of Spanish missions all over California. The first recorded major production of apricots in America was in 1792 south of San Francisco. 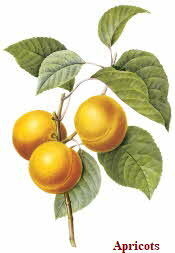 In Latin, apricot means 'precious,' a label earned because it ripens earlier than other summer fruits. A relative of the peach, the apricot is smaller and has a smooth, oval pit that falls out easily when the fruit is halved. California harvested 77,300 tons of apricots in 2003.